The following tweet seems to have elicited a lot of debate on Twitter in the last few days, at least among a certain group of people. Musk of course is a man whose followers tend to be as credulous as the followers of Jesus. After all this is a man who somehow fooled a vast number of people into thinking he had out of nowhere solved the energy storage problem. The 21st century keynote is much more effect than sermons on the sides of mountains. So if Musk says this it is likely that a lot of people will simply believe him. It is still possible that he did not say this. The tweet was just from someone at one of Musk’s events, but it seems to have been corroborated by others. So, I’ll assume here that he did in fact say it. But is he right here? Simple answer: no. And if Musk really does think the answer is yes, then we should probably question his basic understanding of energy systems. I happen to have been visiting Durham in the north of England yesterday. 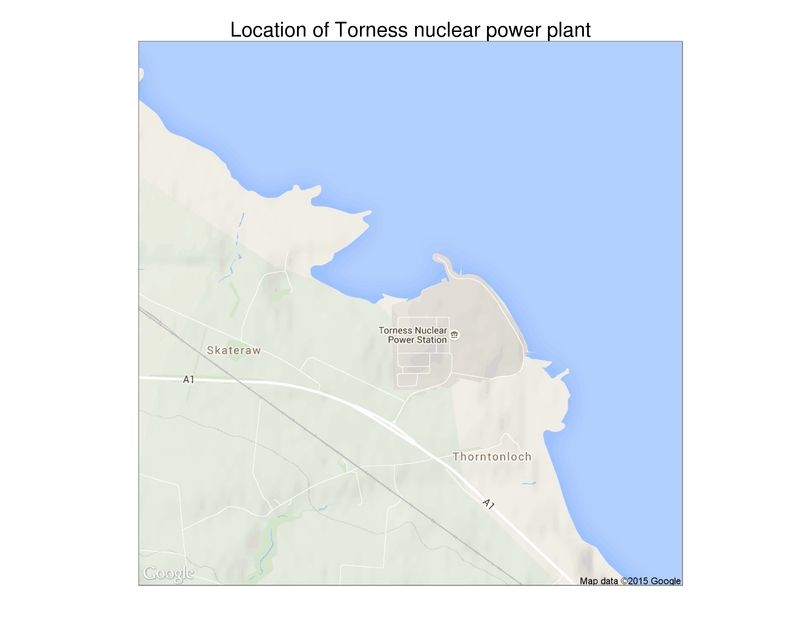 I travelled there from Glasgow on the train which involves passing by Torness Nuclear Power Plant. The train passes right next to the reactors, in fact a juiced up Tiger Woods might have, a decade ago, been confident of hitting the side of it using a driver with the ball teed up on the rail tracks. Made up of two reactors – Torness 1 and Torness 2 – this power plant has a total capacity of just over 1.3 GW and has an average life time capacity factor of just over 70%. Now, let’s imagine that we wanted to replace with a solar farm. According to Musk we could do this by placing the panels within the power plant. Indeed. Placing solar panels in this or any part of Scotland is probably not a wise idea. The sun appearing is an event of religious significance here. So, instead of thinking about Scottish solar, I’ll think of desert solar. Desert solar farms have a power density of just under 10 W/m2, as shown by David MacKay. 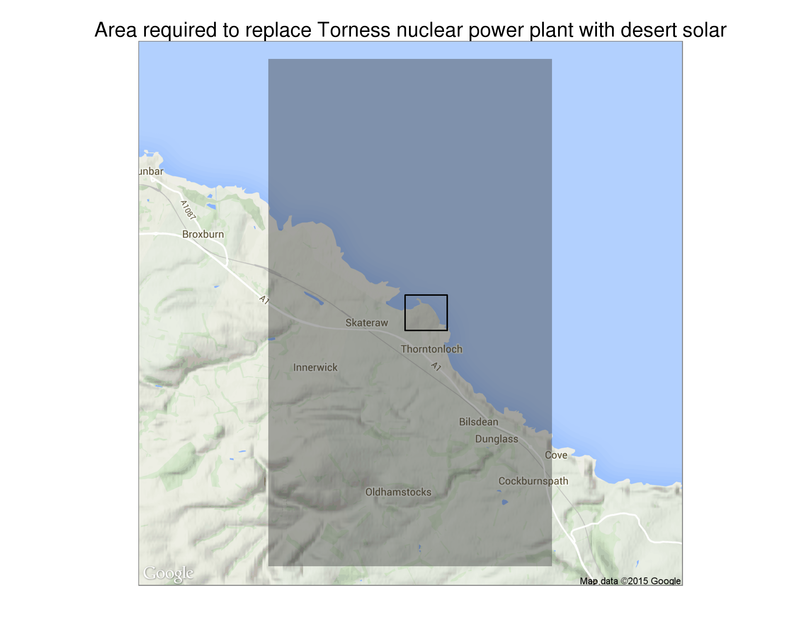 We would therefore need around 91 square kilometres of desert solar to replace Torness Nuclear Power Plant. Let’s show this on a map. To do this I will have to zoom out a bit on the map shown above. It can’t fit into the above map. The shaded area below is what would be required for desert solar to replace Torness. The box shows where Torness is now located. So, clearly Elon Musk is wrong. Solar energy installations take up at least ten times more space than nuclear power plants. This is a well established fact. The issue is discussed in more depth in Vaclav Smil’s recent book Power Density, which provides estimates for the spatial requirements of a large number of nuclear power plants and solar farms. I fully support poking holes in the Musk hero worship that seems to grip anyone semi-tech focused, but to be fair, he might have been considering the full lifecycle land impact of nuclear power, not just the actual generation plant? Even if that is the case then he would be wrong by orders of magnitude. Read Smil’s book which reviews actual data for the full life cycle. With solar only providing at most 20% up time capacity, wouldn’t solar require more land and pump water storage to provide electricity on demand?